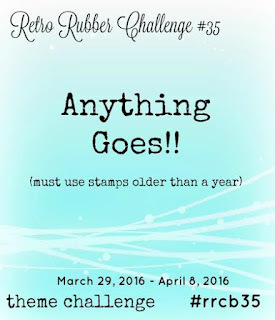 Retro Rubber Challenge #35 - Anything Goes! Hello everyone. I hope everyone that celebrates Easter had a nice one! It was very quiet here yesterday with everyone getting together with their families for big lunches. 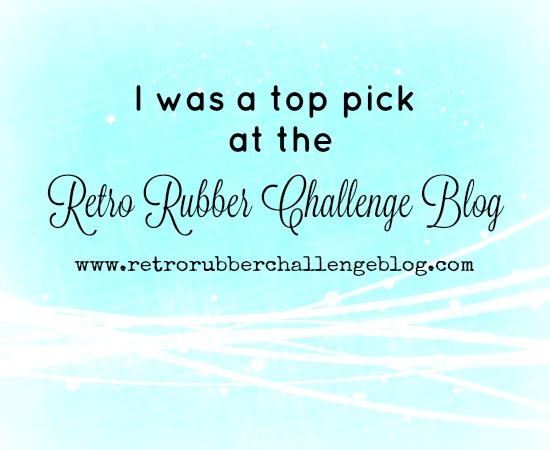 Today I am the "guest designer" over at the Retro Rubber Challenge Blog for their Challenge #35 - Anything Goes. 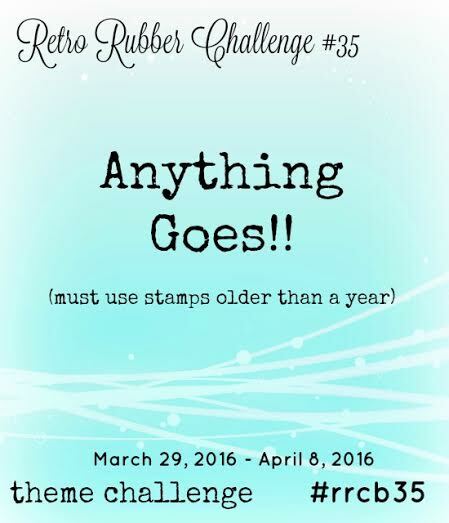 I love these challenges because there are no rules...just make a great card using stamps older than a year! For this challenge, now that Spring has sprung in the USA, I thought I would use one of my favorite older stamps by Outlines Rubber Stamps, from their 2011 Spring release called Summer Breeze (I-1147). Unfortunately this company (my favorite) went out of business a few years ago but, after searching online, I found out that Hampton Art now sells this stamp. I started with an A2 top folding Kraft cardstock card base. To this I adhered a piece of black cardstock, 4 1/8" x 5 3/8". Then I cut a piece of white cardstock, 4" x 5.25", and distressed the whole piece with a mixture of Broken China, Tumbled Glass, and Shaded Lilac Distress Inks. Once the inks were dry, I stamped the image in Onyx Black Versafine ink and embossed with clear embossing powder. Then I colored the whole image in using Sharpie markers and then added some Yellow and Orange Stickles to some of the flowers, a butterfly die cut and some sequins. To finish off the card I adhered my cardstock to a piece of fun foam and then adhered these both to the black cardstock. For a final touch I applied a Clear Wink of Stella Brush Pen to the butterfly and adhered some crystals to the center of the butterfly. Hello everyone. Well I finally got over my cold but now I am just trying to take care of a lot of small stuff around the store. We had poor Latte fixed two days ago and he has been such a trooper. The cone comes off when he is around me so that I can make sure he is not licking. I think, out of all the dogs, he is my fav. I love his eyes! Today I am coming at you with an Easter card I made for the Retro Rubber Challenge No. 34 - Hopping Down The Bunny Trail, which means using an Easter theme - eggs, bunnies, or candy....on your card. I don't have that many Easter stamps but the bunny stamp I used on my card came from a free, exclusive stamp set from the Quick Cards Made Easy magazine from 2013. Talk about waiting a few years before using a stamp. LOL. To make the card - I started with an A2, top folding, white cardstock base. I adhered a piece of pink cardstock to the card front. To this I adhered a piece of patterned paper, 4 1/8" x 5 3/8", from a paper pad called Loolah by Creative Imaginations. Then I took a piece of the same pink cardstock I used on the card front and cut and embossed the Filigree Delight by Spellbinders, which I adhered to the patterned paper. Next, using the largest oval die from the Petite Ovals Small set, I cut and embossed a piece of white cardstock, stamped my bunny image in the center with Memento Tuxedo Black ink and colored her in with various Copic markers. Then I masked my image and, using Broken China and Mowed Lawn Distress Inks, I colored in the sky and grass. Using the same oval die, I die cut a piece of white fun foam, adhered it to the back of my image, and then adhered both to the card front. Final steps were to use a Clear Wink of Stella Brush Pen on the flowers - to give some shimmer - and some dots of glossy accents around the frame to give some clear accents. Done!! I hope you have enjoyed this quick Easter card. 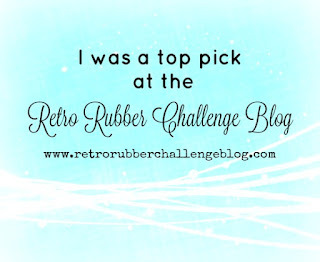 If you want to add your own card to the Retro Rubber Challenge, just click HERE to upload your card and link you blog post. You have until March 25th to enter a card. Hope you do!! Hello everyone. TGIF!!! The start to another weekend. Today and tomorrow we have our friend Ana Stela in the store teaching classes using a scoring board and papers to make some really cute boxes. On Sunday I am going to try and find an arts & crafts fair that I heard about that is about 45 minutes from here. Hope it's good! But let's see if the weather cooperates. 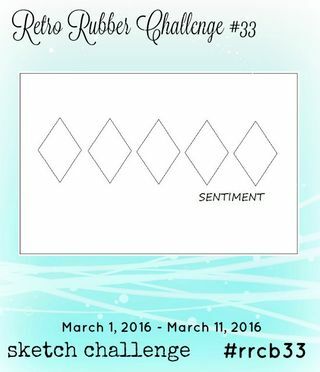 Today I have a card I made for this week's challenge over at the Retro Rubber Challenge Blog. I used a Hero Arts stamp called Wish Big Candles (has to be more than 5 years old) with some cardstock from my stash. Below is the sketch we had to use for inspiration. For my card, I started with an A2 card base, top folding, to which I adhered a piece of cardstock from my stash. I love this design because it allows for color around the whole card. Then I adhered a piece of red cardstock - 4" x 5.25". Then I cut a piece of white cardstock, 3 7/8" x 5 1/8", stamped the candles using a stamp positioner and Memento Tuxedo Black ink. adhered it to the card front, colored the candles in with Copic markers and then applied various Stickles to some of the candles. After the Stickles dried, I stamped the phrase on another piece of white cardstock, trimmed it, adhered it to a piece of red cardstock, and then adhered both pieces to the card front using pop dots. Done!! for my snowman card I made back on February 18th!! Kinda cool! Today I have a card that is perfect for either Easter or to say "Some Bunny Loves You". I used an oldie but a goodie....Bunny Tail that was made by Outlines Rubber Stamps (now out of business..sniff...sniff..). I started with a 4" x 4" card base of purple cardstock. Then I cut a piece of white cardstock, 3 5/8" x 3 5/8" and, using a cloud stencil and Tumbled Glass Distress Ink, I made the clouds. Then I stamped the image using Memento Tuxedo Black ink and colored the image in with various Sharpie markers. For the bunny I used a brown Tombow Marker and mixed it with a Clear Wink of Stella Brush marker to get the shimmer. Lastly, I used Mowed Lawn Distress Ink on the bottom for the grass and adhered some crystals in the center of each of the flowers. Labels: 4x4 Note Card, Outlines Rubber Stamp Co.
Hello everyone. As I mentioned on my blog post yesterday, today starts The Daily Marker's 30 Day Color Challenge and I plan on participating again. THIS post explains it all. There's no pressure, no requirements other than to "try" and color for at least 10 minutes per day (code for "relax") for 30 days, you get to have a lot of fun AND you get to meet some amazing friends and other artists along the journey. And you have chances to win prizes too! What do you need to do to have your name entered into the contest? Just leave me a comment on each days project telling me what you thought (good or bad). You can also "follow me" on Instagram, or become my "friend" or "follow me" on Facebook, but these are not requirements. But a cool way to get to know a crazy American artist now living in Brasil. Feel free to pass this along, share with your social media friends. The more the merrier!! Now....off to do my first post for the challenge. Hope to hear from a lot of you guys and make some new cool friends along the way. OPEN to the WHOLE WIDE WORLD! !